Skepticism. It’s about a questioning attitude or doubt. Today I want to share a story about a skeptic. The next day Jesus wanted to go into Galilee, and he found Philip. Jesus said to him, “Follow me.” Philip was from Bethsaida, the hometown of Andrew and Peter. It’s Nathanael, of course. He’s a skeptic, a critic, a pessimist, a killjoy, a curmudgeon, a buzzkill, a wet blanket, a Negative Nancy, if you will. His friends are all amazed and excited and they tell him about this amazing man they met. He’s the one that Israel has been waiting for, the one whom Moses spoke about, the one whose the prophets prophesied about. This is the one! The answer! The Messiah! And Nathanael completely puts out their fiery passion: Yeah, right. Can anything good come out of Nazareth? I can imagine his friends saying: Really Nathaniel. Come on, man. Why you gotta be so negative? We are talking about the messiah here. You haven’t even met the guy yet. Come on and give him a chance. So, Nathanael begrudging agrees. They go off to meet this Jesus character. And when they get close, Jesus calls out: Hey! Here’s a real Israelist! A true believer! An honest citizen! A man you can trust! Pretty high praise from Jesus, right? And Jesus has never even met Nathanael. Again, Nathanael is the skeptic: Who are you? You don’t know me? Who do you think you are? We haven’t even met! He doesn’t give Jesus a chance. Puts off his praise like a surly old sourpuss, curmudgeon. He can’t even take a compliment from a stranger. Kinda pathetic, right?! Here is where things get weird. We know people like Nathanael. There’s even people in out lives that we have come to expect negative reactions from. But what happens next is just a little odd. Jesus responds with this: Oh, I saw you sitting over there, under that fig tree, you know, before Philip found you. And all of a sudden Nathanael is completely changed: Oh my gosh! I’m so sorry. You are the teacher, the king, the son of god we’ve been waiting for! Are you kidding me? Really? What just happened? Negativity Nancy just flipped a switch and turned into Positive Polly. I just tried to tell you that Nathanael. And I’m your best friend. Jesus didn’t even do anything. Barely said anything. All he did was say he saw you sitting over there earlier. And now you believe him. As negative as you were with me, I expected you to at least ask for a sign, a little prophecy, or a healing or miracle or something. Dude tells you he saw you sitting over there and all of a sudden you’re a believer. Really? Why couldn’t you just believe me? Now a lot of people say that this story is really about showing that Jesus can be trusted. If a skeptic who everyone knows to be an honest man decides that Jesus is for real, then you know it’s true. And I get that from a writers point of view. But it’s a little simplistic for me. Why did Nathanael believe? What changed his mind? What Epiphany did he have that transformed him from Negative Nancy to Positive Polly? Here’s the thing: that answer isn’t in the book of John. Clearly, Nathanael had some sort of Epiphany. We just don’t know what it was, what exactly changed in his mind or heart. But there are two things that I think are really important here. First is how Jesus handles Nathanael. Jesus treats this skeptic with kindness. You might even say over-the-top kindness. And unfortunately this is not the way folks out there in the world today tend to treat one another. If we really believe some change is needed, if we really want to change someone’s mind these days, you tend to hear name calling, shaming, defaming, belittling, publicly calling people out in ways that tear down. And everybody’s doing it. Watch the news. Look at Facebook. Read the newspaper. It’s not like just one group is doing it. It seems to be everyone. Christians and atheists. Rich and poor. Democrats and republicans. White folks and black folks. Men and women. It seems to be folks from every segment and sector. He flatters Nathanael. He doesn’t lie, he just artfully and beautifully elaborates on the truth. He is down to earth with Nathanael. Always Respectful even in the midst of Nathanael’s negative and kinda hateful remarks. He calls Nathanael in to his inner circle. He invites him in. We welcomes him in. And he stays in a positive and meaningful relationship with him until he is changed, until his Epiphany occurs. All this positivity makes a difference. And I know another holy man who did this kind of thing: Martin Luther King Jr.
King called people in from the best of who they are. He shared a positive vision with the world even as he stated the sometimes uncomfortable truth. He treated people always and at every time the way he would want to be treated – non-violently, respectfully. He returned peace when people spewed violence at him. He treated others with dignity even when it was offered to him. And in the end he changed the hearts and minds of people across these United States of America. King knew that you cannot force people to change. But you can treat them well and call them into an Epiphany of the heart. And King practiced this in everything he did. But it wasn’t easy. And I suspect it was always easy for Jesus either. 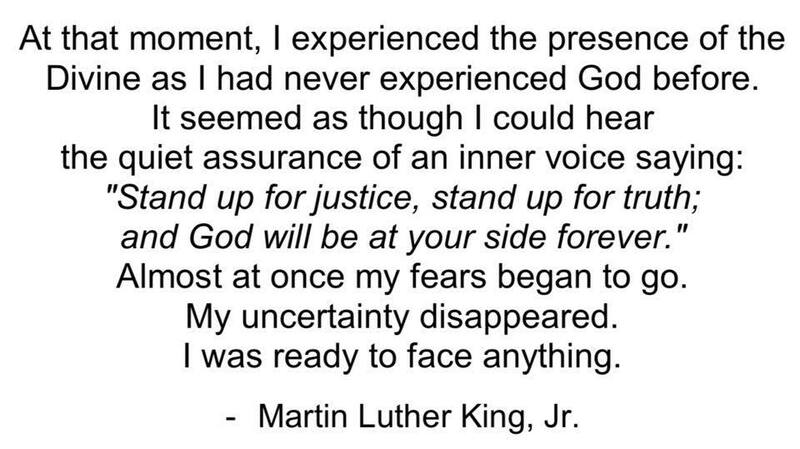 In order to act the way we see Jesus and MLK act, today we people of the United States seem to need our own Epiphany. We need to change our hearts fro this hate-filled way to talking about one another. From the highest office to us average Joes to the lowest of the low, we need to change our minds and decide to act respectfully, with dignity, with integrity, speaking the truth in kind and loving ways that call people in to what is good and right. We need to decide that name calling is wrong, dehumanizing, and evil. We need to realize that we have more opportunity with one another, more effect on one another when we welcome one another, when we invite one another in to see who we really are, when we are kind and loving and respectful. We need an Epiphany that turns everyone of us from a Negative Nancy to a Positive Polly. It happened to Nathanael and it can happen to you, too. It happened because Jesus treated Nathanael a certain way and you can treat others that way too and you will find that the Negative Nancy’s around you will start turning into Positive Polly’s as well. Divine as I had never experienced God before. Almost at once my fears began to go. Brothers and sisters, in these days we need to be ready, like King, to face anything with love, respect, grace, kindness, dignity as we call the world in to the love and grace of God witness through his son Jesus Christ.